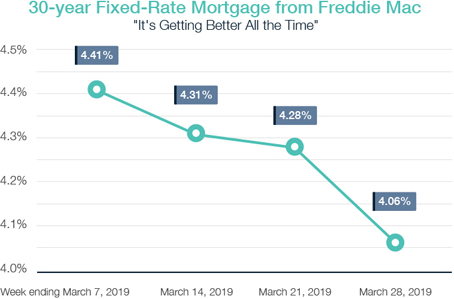 “It’s getting better all the time” (The Beatles) That is the best way to describe the current home loan rate environment. This past week we saw mortgage rates experience their largest one-week decline in 10 years! What caused the sharp decline in home loan rates? Recessionary fears, and the likelihood the Fed’s next move on rates may be a cut and as soon as this year. The upcoming week will bring the March Non-Farm Payrolls (Jobs Report), which comes on the heels of February’s very weak 20,000 job reading. Revisions for the two previous months will be key when the report comes out on Friday, especially if the February number gets bumped higher. Wage growth, currently running at 3.4% year-over-year, and the highest in a decade, will also be delivered in this report. Should the wage gains increase further, bonds may not like the inflationary tone that goes along with higher wages. On Wednesday, we will get a preview to the Jobs Report when the ADP Private Payrolls is released. Any additional headlines surrounding recession fears will also play a role in which way both stocks and bonds trade. As you can see there’s a lot of headline risk as we head into this week. A gauge of consumer spending will be released on Monday in the form of Retail Sales, along with the ISM National Manufacturing Index. On Wednesday, the ADP Private Payrolls report will be delivered along with the ISM Service Index. As usual, Weekly Initial Jobless Claims will be released as they hover near lows seen in the late 1960’s. The closely watched government Jobs Report will be released on Friday, which includes Non-Farm Payrolls, the Unemployment Rate and Hourly Earnings.